I enjoy Mondays. Honestly, I really do. 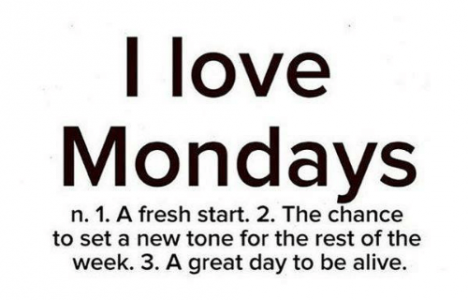 Mondays are chance for a fresh start to the week. And if you can get off to a good start on Monday, then the rest of the week has a pretty good chance of going good as well. And if you start to have consistently awesome days, your whole life can sometimes open up right before your eyes in ways that you never imagined. Your dreams can start coming true and you can be the person that you were meant to be. So how does Matt have a great week? 1) He starts it off every day with an amazing smoothie. It’s a great nutritional kick start to my day. 3) I usually like to get a run in on Monday as well. That helps me also balance my day. 5) I try to find meaningful ways to spend my time on things that help me feel good and give my life a sense of purpose. THOUGHT FOR THE DAY: You are now, this moment, exactly what you have been in the process of becoming all your life. Are you now the person you dreamed about becoming? If so great, if not make some changes in your habits. I hope this e-mail has encouraged you in some way. Keep being awesome and go dream those dreams and go tackle those goals. Today is the day to do them Don’t keep putting it off. We are only on this earth a short time.